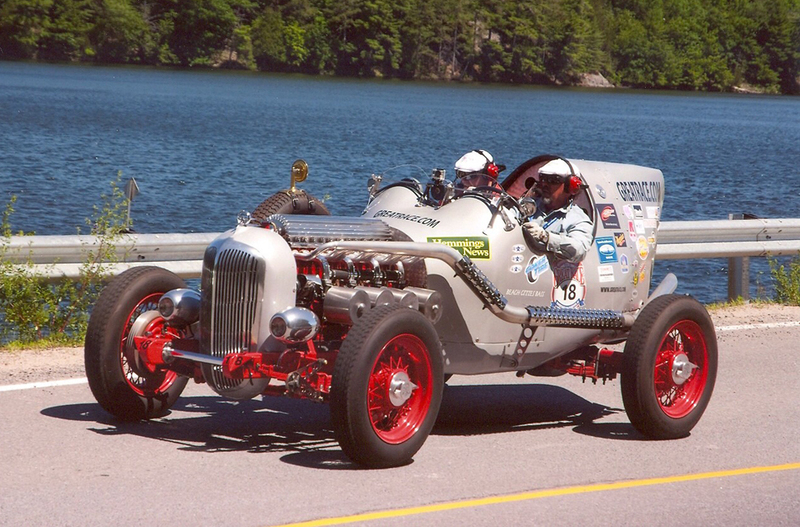 As legend and lore would tell you, the 1936 BeerSter is a Buick Powered Boat Tail Special conceived and hand constructed by Mike Larkin and Milt “PeeWee” Thomas. The motivation for this creation was to enter a truly uncommon car in the “Great race” and in as many car shows whose attendees would truly appreciate the car. The Great race is held every year and has a different origin and destination. The race usually has its start on the East Coast and ends on the West Coast and covers about 4,000 miles over a 14-day period. The formulation of the first BeerSter concepts, rough sketches, and abstract visions were produced in 2002. This was accomplished after expending great amounts of spirituous libation (Martinis) and hours of handling draft dispensers (Beer). Mike and Pee Wee’s design principle was that the car had to look as if it were sired in a thoroughbred stable at the Churchill Downs facility in Kentucky. The design specification mandated that the components used on the BeerSter were to be made up of a variety of stock and rare mechanical parts typical in the running of the 1937 Indianapolis 500. Most all of these components had to be created from scratch. People who have viewed the BeerSter for the first time have stated that they did recall the car and, in fact, a few old timers even remembered working on the very same racecar back in the day. Youngsters that remembered the car from that era told Mike and PeeWee that the car looked like a silver bullet or maybe shaped like a military fighter plane. The original BeerSter, they recalled, was all engine, with special updraft carburetors, bright exhausts and intake manifolds. Some remember that the original engine was a Hallsted and or a Frontinac or something, but it was big! None that had seen or worked on the BeerSter in the past could give exact evidence of the running gear. The imaginative rusting equipment found and made part of the BeerSter were the entire front axle assembly, the 1936 Buick grill (highly modified), the engine, and all four of the 20” 1929 Oldsmobile wheels. Unfortunately, a bona fide rusting BeerSter frame and body with panels could not be found. During the re-invention, much attention to detail was preserved by Mike Larkin (Old Yellar#1 Fame) on the rolling frame, body and interior selections. The remarkable construction of its Buick engine, with all of its pre-war hardware and billet specialty items, was handcrafted by the Industrialist and Car Collector Milton “PeeWee” Thomas. As the BeerSter neared the finish line of construction, it came alive with memories of the past and with more promise for the future. Its flowing lines with artistic license, the sparkling precision of the power plant, and the gem-like quality of the intake and exhaust manifolds will give pleasure to many of BeerSter enthusiasts now and in the future. While at the shows or other events, Mike or PeeWee will be glad to answer any questions about this remarkable creation. Our motto and embedded logo is “Straight 8 powered BS” and we are very eager to spread as much V8-powered BS as we can.